Create an outdoor space where you can enjoy your view and enhance the look of your home at the same time. 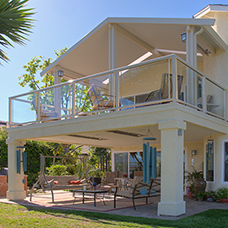 All-Pro Remodeling will replace or build a new custom wood deck that will compliment your homes looks and provide more outdoor living space and viewing areas. All of our decks are custom designed to accommodate the design of your home and allow it to blend as seamlessly as possible. A standard on all our decks is a 3-stage weather sealed apoxy coating which provides waterproofing for the floor of your deck as well as the area underneath. This apoxy coating is available in many different colors and textures. There are many options available to provide the look you desire. 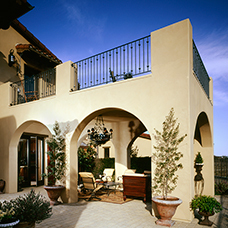 A stucco exterior is one of the most popular options and serves several purposes. It provides protection for the wood elements from weather damage and termites. 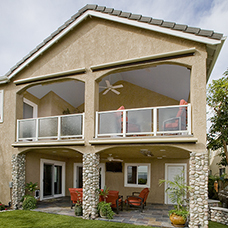 It also matches the exterior look of any stucco home. 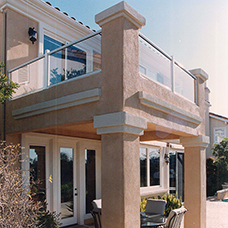 Several railing systems are available to you including aluminum framed full-view glass or aluminum rod railing. The posts also come in a variety of options which include standard deck posts, round or square fiberglass columns in several sizes, and custom stucco pedestals.